He’s sending quite the message to his former teammates and the game he ostensibly loves. On the one hand, we can chalk this up as irrelevant theater. O’Neill joins such sports misfits as the proudly bigoted John Rocker, the proudly bigoted Mike Ditka, and two icons—Mike Tyson and Dennis Rodman—who would endorse American Pharoah for president if it meant getting on camera. Yet Paul O’Neill is not a reality show contestant, like most of Trump’s other athlete endorsers. O’Neill is more than an ex-Yankee. He’s a broadcaster on Steinbrenner Soviet State Television, otherwise known the YES Network. He has become yet another example of Trump leveraging the sports world—and by extension a toothless sports media—to attain favorable coverage. 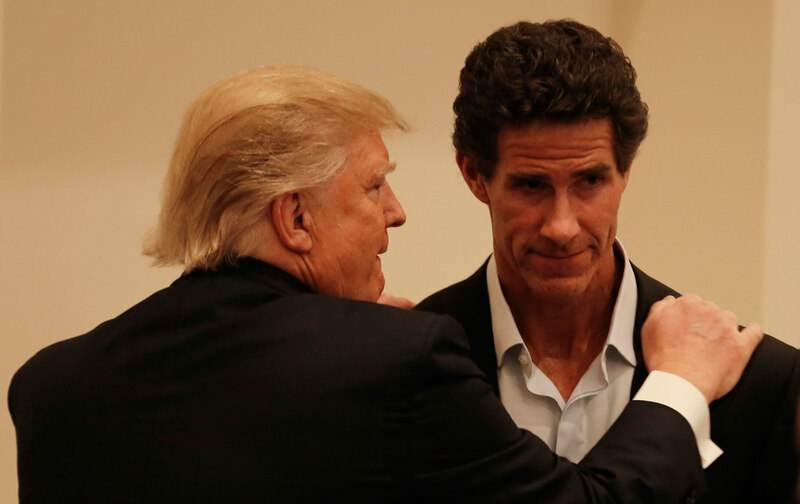 Sure enough, O’Neill’s endorsement has been all over the Web this morning, but the articles read more like Trump product placement than critical coverage. The articles mention O’Neill’s lifetime batting average, his World Series heroics, and his Ohio roots. They don’t mention some other salient facts: Baseball would not exist without Latino talent, particularly from the Dominican Republic and Venezuela. In 2014, 26 percent of MLB players were born outside of the United States. Of those 26 percent, almost two-thirds are from Venezuela and the DR (roughly 17 percent of all Major League Baseball players). Donald Trump has of course made the attack on Latino immigrants the centerpiece of his campaign. Whether it’s lies about the influx “Mexican rapists,” or lies that the Mexican government is sending criminals across the border, or lies about the number of immigrants crossing into this country, or lies in his commercials claiming to show a run at the southern border, when the footage is actually from Morocco, Trump is playing a dangerous and racist game. He is thus far reaping the rewards, with support from white nationalist groups that traffic in the very violence he so casually provokes at his rallies. Trump has also enlisted the notorious Sheriff Joe Arpaio and former Arizona Governor Jan Brewer to assist him in his efforts. These are people who proudly endorse the idea of giving the police the right to check the papers of anyone they suspect of being “illegals,” codifying racial profiling and criminalizing anyone with brown skin. This brings us back to Paul O’Neill. He’s not a circus sideshow like John Rocker or Dennis Rodman. He’s not even someone like “friend of the Trump campaign” Tom Brady, whose sporting life does not put him in touch with many immigrants beyond the occasional East European placekicker. He is covering a sport where a requirement of the job is interacting with Latino players. What is O’Neill saying through this endorsement of Trump to former teammates like Mariano Rivera or the players he currently has to cover, like Michael Pineda? It calls into question just what Paul O’Neill is thinking these days about the game he ostensibly loves and the people paid to play it at the highest levels. Make no mistake about it. O’Neill has every right to endorse whom he wants, and no one should tell him to just “shut up and play” (or “shut up and announce,” as the case may be), but that doesn’t mean the media has to be campaign stenographer instead of examining the implications of such a move. The demography of baseball is changing. If Paul O’Neill wants to drag it backward to a time when teams openly had racial quotas, he should make that clear and deal with the repercussions. When New Yorkers pay their inflated cable bills to subsidize the YES Network, they should know both who and what they are actually paying for.